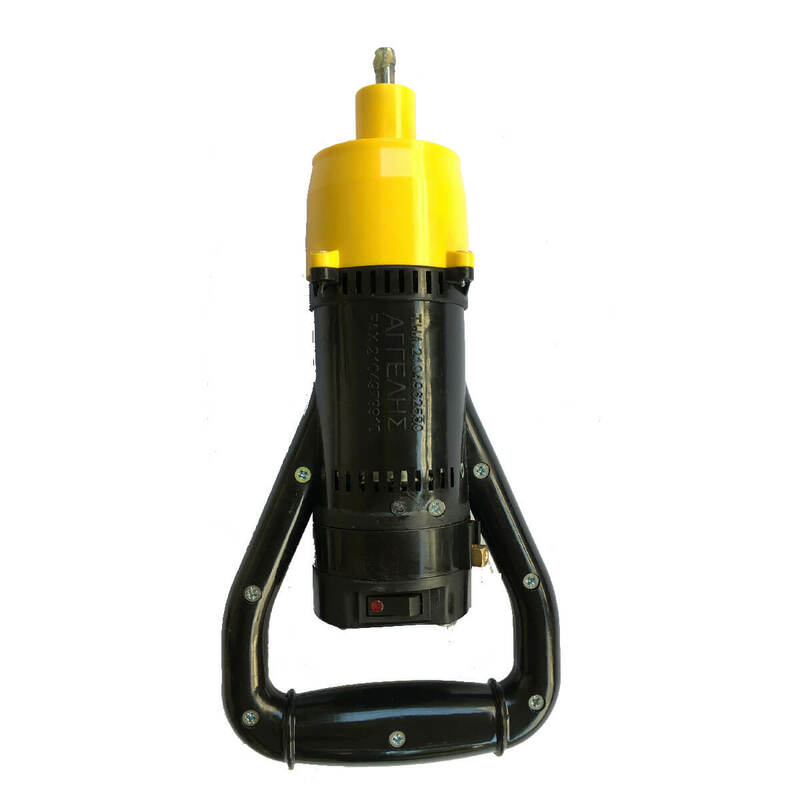 Place the injection pins of the cord to the respective current supplier (generator, battery, rectifier 12VDC). There is not polarity (+ -), so it does not matter how you place the pins as long as they connect properly to the receptors of the supplier. Start the generator or battery or 12VDC rectifier. The consumption of the devices is 8Α/h. Press the on-off switch at the base of the harvester. The harvester is now working. 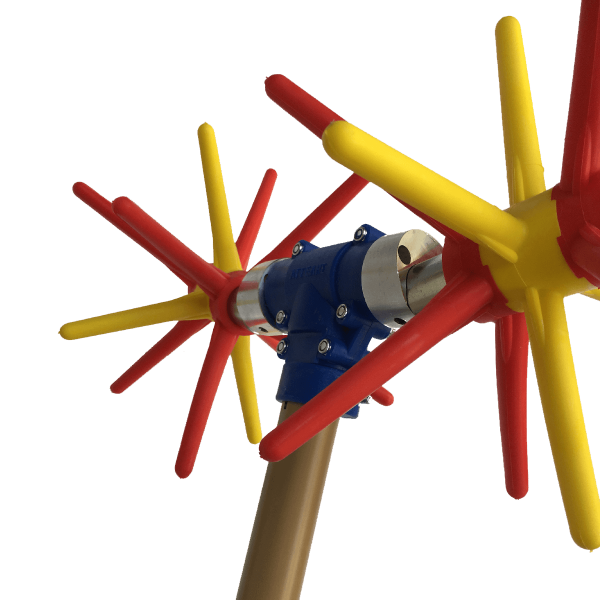 AGGELIS 5 is a pulse motion, double head olive harvester. 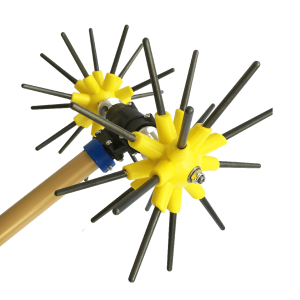 24 sticks in 2 heads with pulse rotation movement. An aluminium tube for lower weight. The head consists of two gears made of induction hardened steel, at a differential crown position and cut to their axis. This position offers the advantage of doubling the number of rotations while minimizing the wear on the reducer’s motor and the tube’s motion axis. 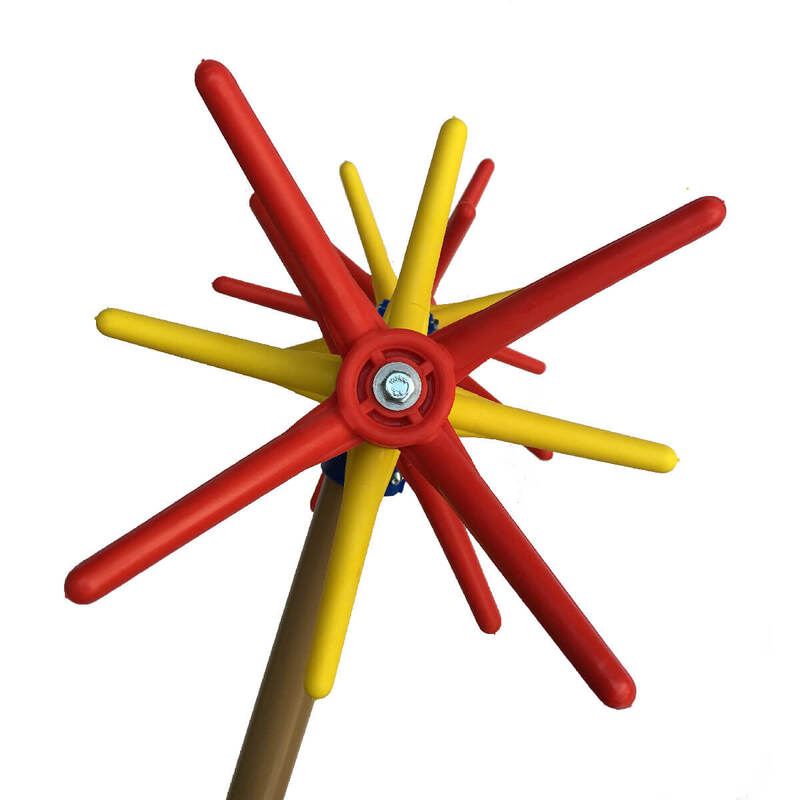 Two adjustable counterweights convey the special balanced pulse movement to the square steel levers with ball bearings, even without the four-winged sticks. As a result, there is no heat transmission and therefore extra wear on them. 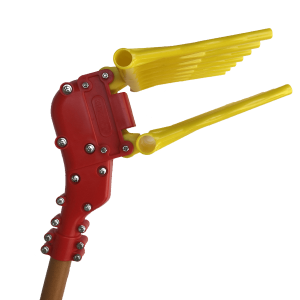 The four-winged sticks (4 conical and 2 straight) have inner holders and they are attached right and left on the levers in an innovative way, to achieve a more successful beating. 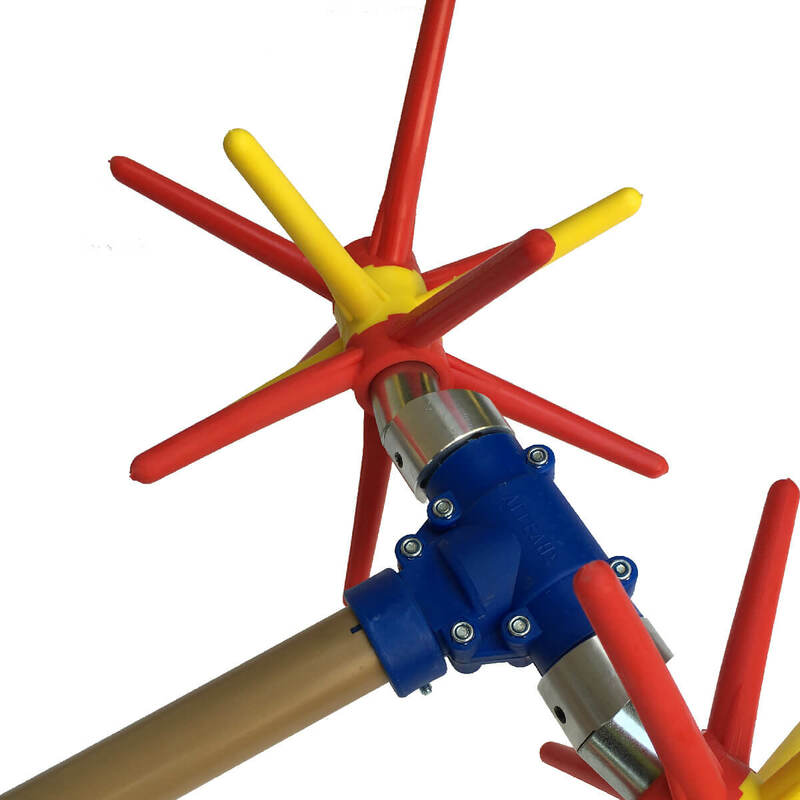 Its tube is made of aluminum, it has a 8mm threaded rod made also of aluminum, of T8 hardness specification and it is protected by anti-vibrant rubber and ertalon rings. It works with car battery (with added converter), with consumption 10-12 A / m.
The AGGELIS 5 has a DC type BOSCH 600W electric motor with a steel gear in its axis. The οn-off switch is 35A. 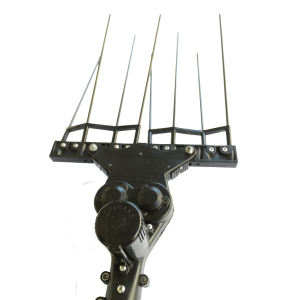 The satellite reducer has a metallic pitchfork and ertacetal gears. The reducer conveys the motion from the axis to the head through a compler. The pulse movements of the two heads carbon fibres can reach up to 2000 per min at 16V. All of our harvesters come with a 2Χ4 square cable, 15 m. long. There is no polarity at the outputs. If however you wish to use a purchased or a makeshift battery, you should put a voltmeter at the output, to ensure that the voltage does not exceed the 16V.